While pearls are a traditional choice for a bride to wear on her wedding day, they are a less common gem for an engagement ring. However, pearl engagement rings are gaining in popularity as brides look for new and unique ring options. They represent sincerity, faithfulness, and loyalty, appropriate symbols for the beginning of a lifetime together. They are available in several varieties, including saltwater or freshwater, and cultured or natural. Saltwater versions are formed when an irritant finds its way into an oyster's shell. The oyster covers the irritant with a shiny substance called nacre. Thicker nacre results in a more lustrous and durable pearl. The irritant may be naturally occurring, or introduced by the producer, as in cultured pearls. Freshwater varieties are formed by mussels, and are composed almost entirely of nacre. Several factors must be considered when choosing a pearl for an engagement ring. Common colors include white, cream, green, blue, silver, and black. Overtones add a second dimension of color. Lustre, the shininess or brilliancy of the pearl, derives from the many layers of nacre that comprise the body. The pearl must be examined carefully for blemishes. Finally, size and shape will factor into choosing a pearl. Spherical varieties are the rarest, and thus the most expensive. 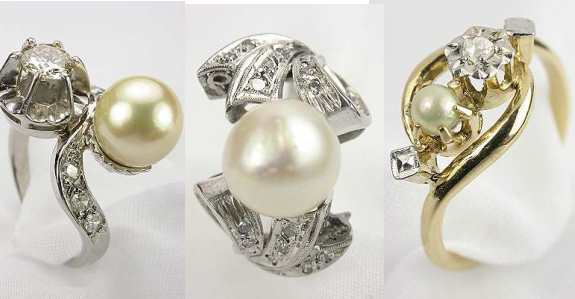 Teardrops and baroque (irregular) pearls are the more common, less expensive options.